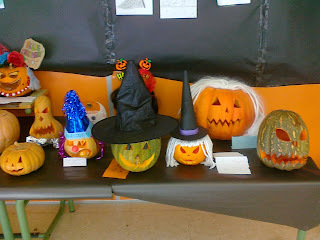 On Thursday 30th October Halloween came once again to our school. That day the students and teachers who came through the main door into the entrance hall found themselves in a gloomy and horror atmosphere that really gave some of them the chills. First, they were welcomed by the school witch who didn’t fail to show up this year. This wicked witch of ours has been naughty lately. Word on the street is that she is the one to be blamed for casting the evil eye on those who fell down going down the stairs that lead onto the playground. So you’d better be nice to her so that you won’t become one of her victims and have no mishaps in your near future. Then darkness pervaded the place. The walls had turned black and cobwebs hung everywhere. 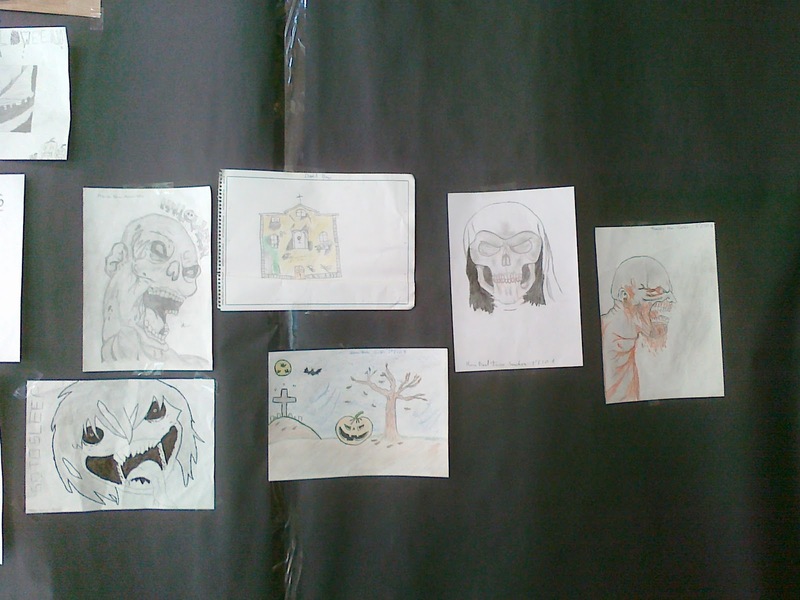 Pictures of haunted houses, bats, skulls, grinning black cats, ghosts, spiders, zombies, werewolves, and other frightening creatures covered the walls. In addition there was a dim light coming from the inside of hollow pumpkins on which sneering faces had been carved. 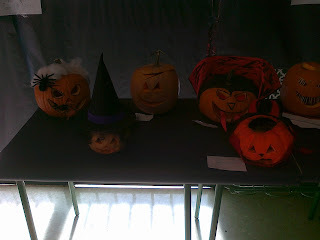 Those were the jack-o’-lanterns who gave a menacing stare to the passers-by. 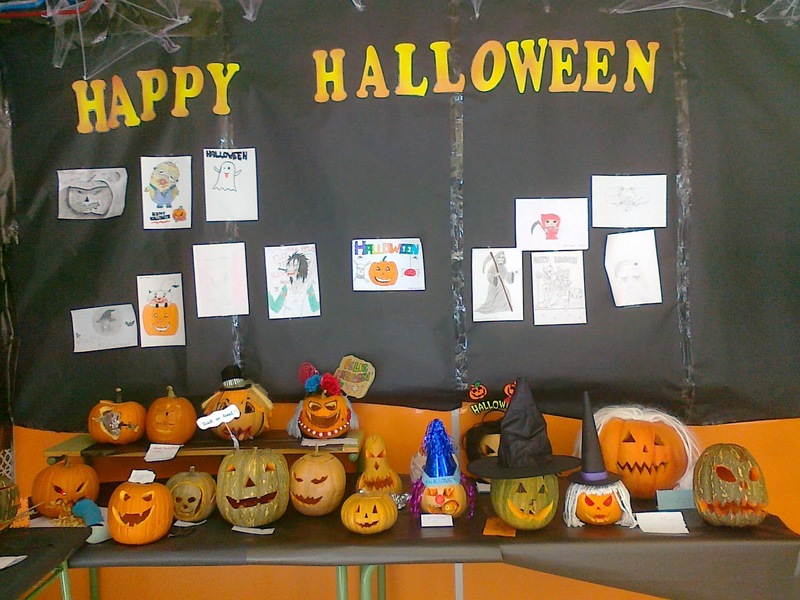 All of this creepy scene was made possible by the collaboration of our students who took part in the different contests organized by the English Department. As every year, the Department held three contests related to Halloween: the horror picture contest, the horror story contest and the jack-o’-lanterns contest. All the works presented were exhibited in the entrance hall for everyone to see and to be frightened of. 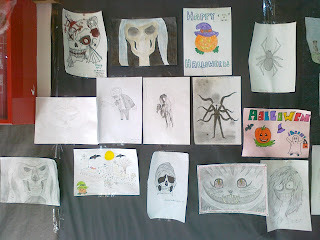 On this occasion our students have proved again they can be really creative as some of their works really could scare you out of wits. Thus it has been a hard job for the members of the jury to choose the winners of the different contests. 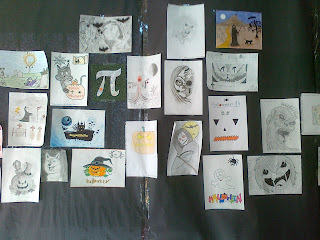 Let us begin with the horror picture contest. 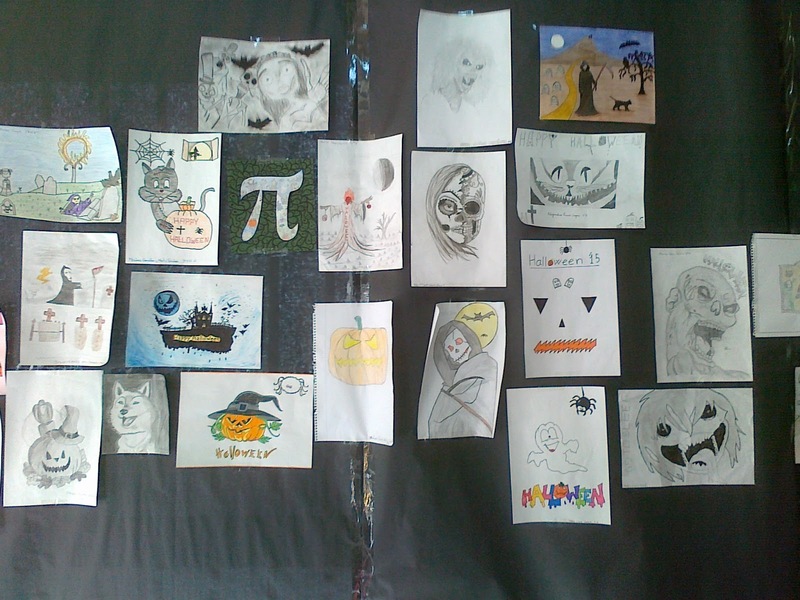 Here Estela García of 1st Year of Bachillerato came in first with a drawing of the number pi symbol surrounded by screaming ghosts. This girl showed us that Maths can be really scary as well as difficult. 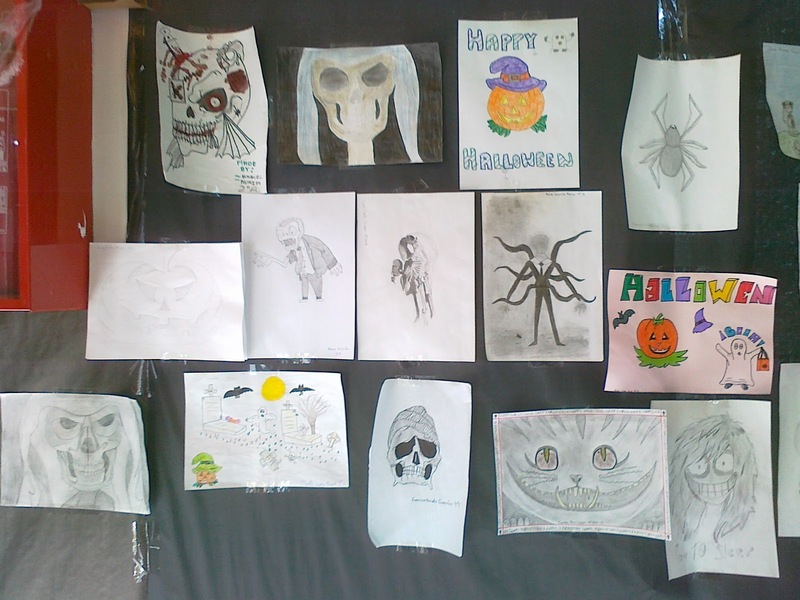 Ana Belén Leal of 3rd Year of ESO came in second with a pencil drawing of a scared little girl surrounded by bats, skeletons and zombies. Then Elena Ruiz of 1st Year of Bachillerato came in third with an original picture of a haunted house that looked like flying boat. Finally, an honourable mention was awarded to Marina Rodríguez of 4th Year of ESO for her picture in which she proved she really knows how to use the colours. 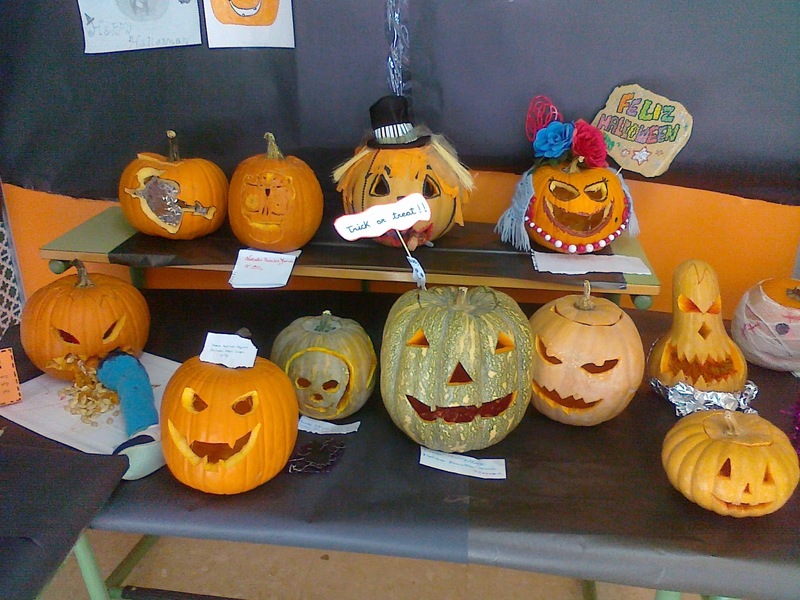 Now let us continue with the jack-o’-lantern contest. 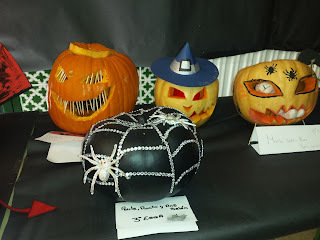 Here Paula Ponce, Rocío González and Ana Belén Leal of 3rd Year of ESO came in first with a pumpkin painted in black and decorated with silver sequins. 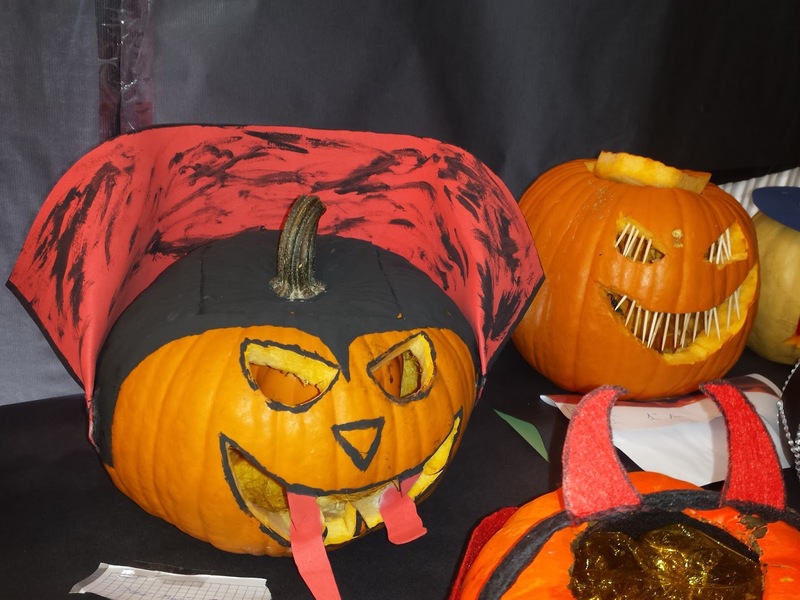 This pumpkin might be the most stylish one that we haver even seen. José María Díaz of 2nd Year of ESO came in second with a pumpkin that had become the Count Dracula himself and was ready to bite with his huge fangs. 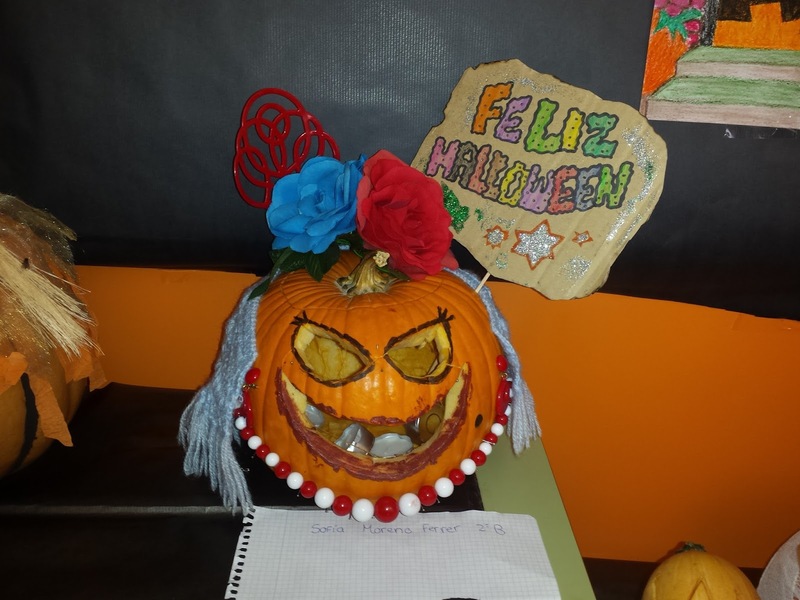 María Jesús Ortega of 3rd Year of ESO came in third with a pumpkin that had become an evil clown. 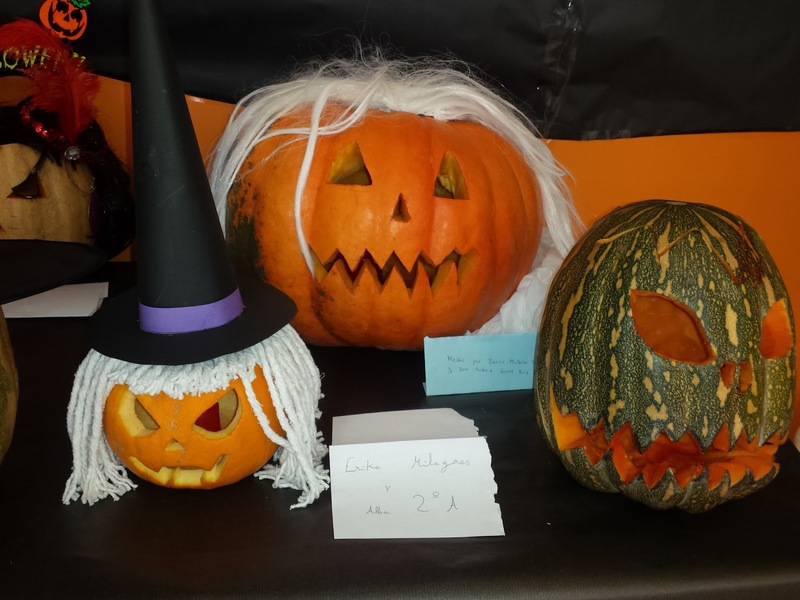 We would also like to mention other pumpkins that were really original and elaborate and, oh boy, they could give you the creeps: one of them was the hungry pumpkin that was devouring a puppet, it gave the gory touch that one. Another one was the typical Spanish pumpkin that resembled a sevillanas dancer with all her combs, big earrings and make-up. 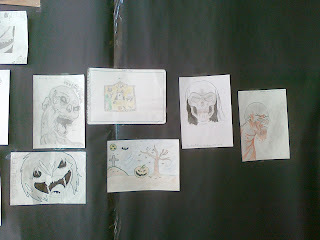 Let us finish with the horror story contest. 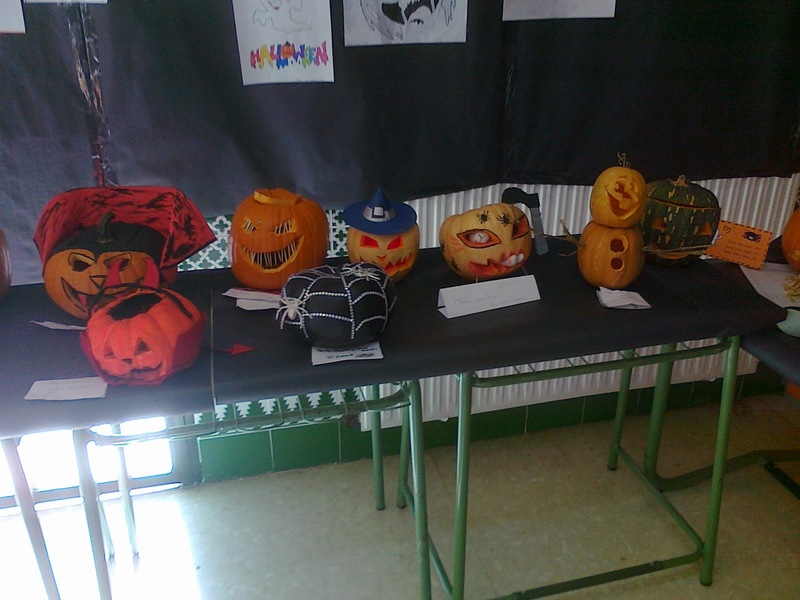 Here María Mateos of 2nd Year of Bachillerato came in first. Then Ana Ester de Miguel of 1st Year of ESO came in second proving that even the youngest students can write good stories. Finally Raquel Morales and Nuria López 2nd Year of ESO came in third with a story written on a book shaped as a jack-o-lantern. That was it. We would like to thank and congralute all the participants in the different contests as they present better works every year. We hope you enjoyed the works and had a happy halloween and we bet you were a bit scared by some of them. See you in a year and keep away from evil spirits and wicked witches.